People play , because they want to improve their spelling skills. Sometimes they even hope playing will increase their chances at winning the National Spelling Bee. Results, however, do not come from flashy animation and evolved story lines. Instead, learners return if they see meaningful and rewarding personal progress. At LearnThat Foundation, we carefully researched "gamification" of learning. How could we make our tutoring sessions more fun and game-like? Which elements helped people learn? Which were distracting? - They 're static, out of the box. The learner has to follow the predefined path of the spelling game. This turns the activity into useless busy work for anyone but the few students who are at the given level. - They're working with a limited number of words. Format and supporting information for the word fails to communicate its meaning and usage. - Animation, story line, and execution delays the flow of learning. Since processes are static, most spelling games quickly become predictable, boring, or even annoying. 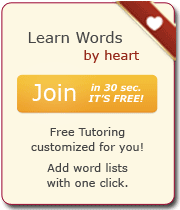 - Spelling games typically reward those with advanced skills. Those who struggle often suffer through the game, start to dislike the activity, and do not benefit from it. - Smart adaptive and systematic intervention is missing from almost every in the market. 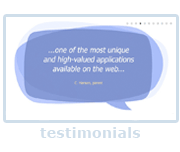 - Quizzes are 100% personalized. 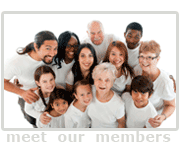 Each session is based on your interests, words you added, and your personal learning history. - Colorful dictionary of 180,000 words. Any words important to you are easily available. 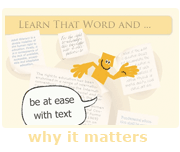 - Each words you study comes with a dictionary entry full of multi-media. Lots of usage examples and background info help you learn. - Learn at your own speed! LearnThatWord works for fast learners as well as less confident ones. No matter how many reviews you need, LearnThatWord will never make you feel bad. - Choose your favorite digital rewards at the end of every session. Members also earn raffle tickets for real world prizes! - Rewards are given for study effort and concentration, not existing skill. - Although quizzes have a test-like format, making a mistake (or showing you don't know something) never has negative consequences! It simply adds the word to your personal practice list for more review. - Diplomas mark your progress with customized, printable certificates. You can also form teams for friendly competition.